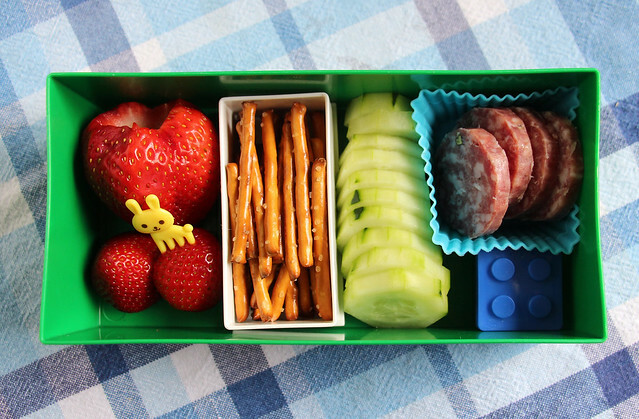 I packed Augie’s lunch in our Lego bento box : strawberries with a bunny pick, pretzel sticks (in the smaller, white Lego box ), cucumber slices, salami and a small Lego container of hummus. When I was done I realized I accidentally packed a rainbow lunch for him. Cool! 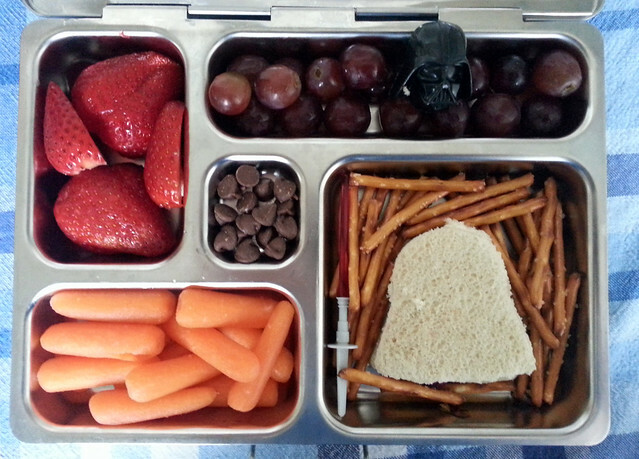 On Tuesday, Dad packed Augie a Star Wars lunch in the PlanetBox: strawberries, grapes with a Darth Vadar ring, chocolate chips, carrot sticks, a Darth Vadar sandwich and pretzel sticks. It’s hard to see, but there’s a light saber in with the pretzels, too. Wyatt had lunch at school. 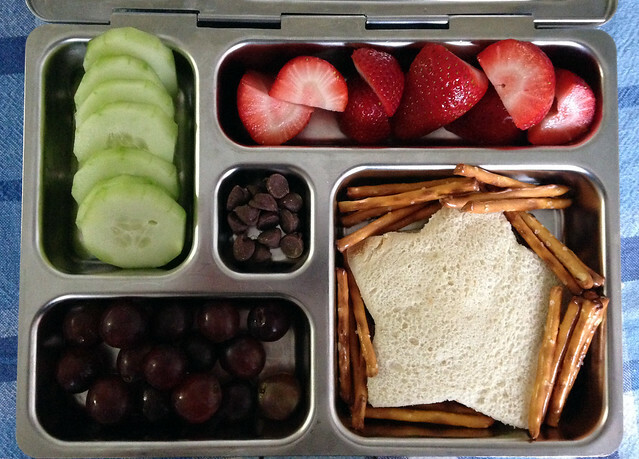 And on Wednesday, Dad packed another PlanetBox lunch: cucumbers, strawberries, grapes, chocolate chips, a star-shaped pb&j and more pretzels. Wyatt had school lunch again. Thursday, I finally felt well enough to get up and make the lunches in the morning, but I kept it really simple. 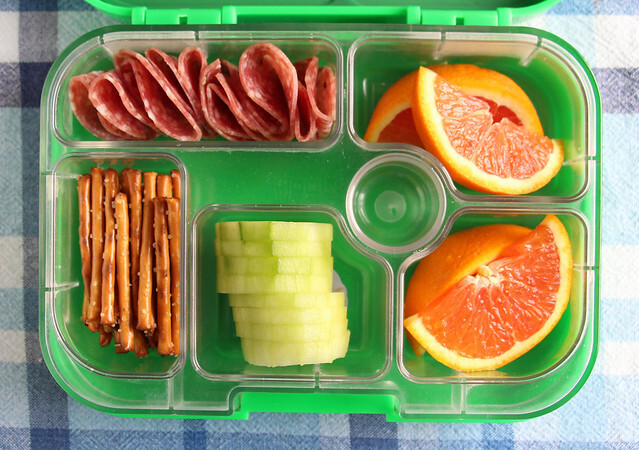 Augie had a Yumbox packed with salami, pretzels, cucumber slices and orange slices. He also had an apple sauce pouch. 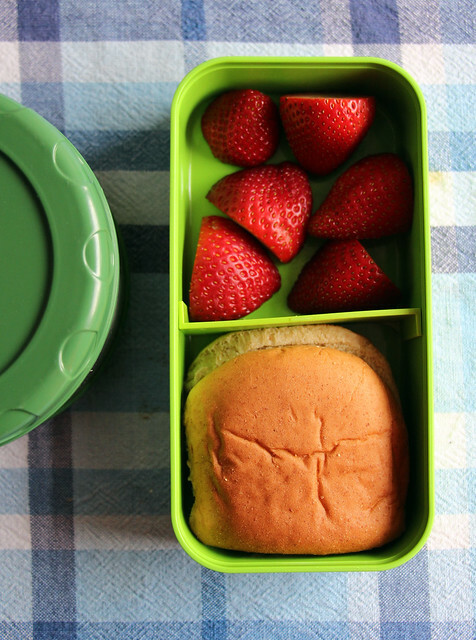 Wyatt had leftover barbecue chicken in the LunchBots thermal jar, strawberries and a bun. I also threw a granola bar in his lunch bag. The idea was that he put the chicken on the bun to make a sandwich. 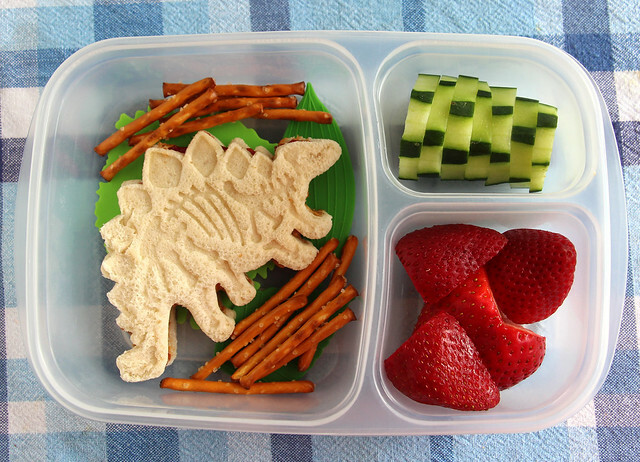 Friday, I was finally on the mend and I had enough energy to pack Augie a fun dinosaur lunch. I pulled out an EasyLunchboxes bento box, lined the main compartment with silicone leaves and put in a dinosaur pb&j that was cut and stamped with one of these cutters. I added some of the pretzel sticks that were in every lunch this week, along with some cucumbers and strawberries. 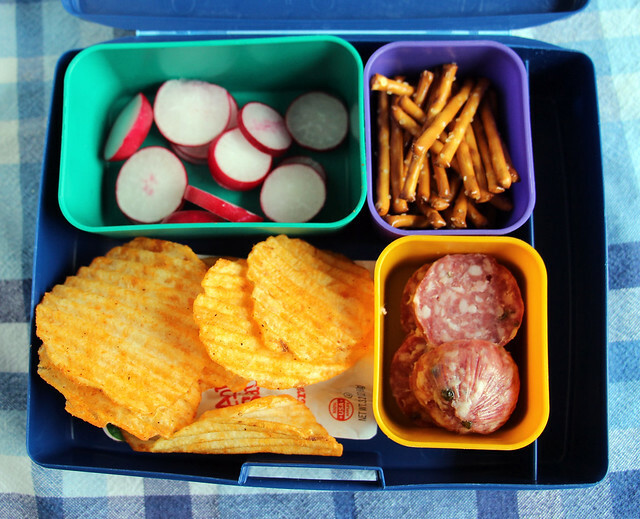 Wyatt had exactly the same lunch that I gave him on Thursday — packed in the same containers and everything.